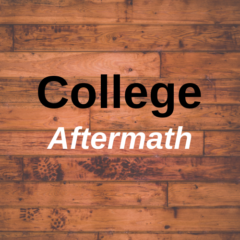 Taking a gap year after finishing university can be one of the most valuable experiences of your life. At no other time in your life will you be able to take so much time to just focus on growing as a person and see the world. The knowledge gained and experiences that make up the best traveling break between education and career, between adolescence and adulthood, are unrivaled by almost any other opportunity in life. For Jeremy Macdonogh, the time spent criss-crossing Europe was an adventure unlike any other. Below is a short excerpt from his book, A Gap Year or Two, having just arrived in Rome on his own extended gap year with almost no money and without a job but confident that something will come up. It seems to me that there is a particular quality to Rome beyond the obvious stuff of its being the world’s most romantic city and arguably its most enchanting. Arguably? I’ll leave that argument to the Parisians. No one can deny that Europe contains a vast number of seriously beautiful cities. Try Bruges, Copenhagen, Prague, St Petersburg, Venice, and Salamanca just for starters. But Rome is always in good spirits. The noise of people in restaurants, or when they talk to each other in trains and buses, the buzz of negotiation in the markets; it is all one contented murmur that bubbles up into cheerfully raised voices from time to time. Even when they are cross with each other, which mainly seems to happen on the roads, their expressions of displeasure are almost comical in their length and complexity. And a really good insult will earn you a round of applause from the spectators who, sure as eggs is eggs, will gather around. For Italian speakers, the best such insult I ever heard went something like this; ‘sònate la panza gràvida di quella mignotaccia de tu sorella colle osse de’ meio mortacci tua’. I am afraid I dare not translate it. Rome is probably the last of the great capital cities where strangers will greet each other as they pass early in the morning with a spirited ‘buon giorno’. If an Italian wears a hat, and many still like to, it will always be raised to a lady, though possibly with a tad too much gallantry. As I sat down opposite Vittoria, I saw that my first impression of her, that she was sensational, understated the case. She was very tall, possibly too slender for my tastes but with a perfect figure that her designer clothes did nothing to obscure. She was wearing maybe a shade too much make-up for the dim lighting in the restaurant, but what’s this? Complaints, already? Just how good can a first day in a new town get to be? Well, she asked me what I did, which wasn’t much of a conversation, as I did nothing. As yet, that is. I asked her what she did, and she told me the glaringly obvious; she was a model, did the catwalk stuff for Valentino, or one of the other big Roman names. What was it like? Oh boring, boring. It is odd how often I was to hear the Romans, in their marvellous city, complain of being bored. Mind you, I was to discover it’s even worse in Florence and Venice. Perhaps being bored is a necessary element in the drive to be creative. In Rome, especially, where with every step you take you are surrounded with the works of the finest creative minds of the last two and a half millennia. We talked cinema. ‘You should work in the cinema’, Vittoria told me. Rome is big on cinema. She had plenty of friends who hung about Cinecittà, the Roman Studios that are home to the Italian Film Industry, hoping to get called for work as an extra. She had done it herself when she was young. It paid well, she assured me. You could even live off it so long as you lived at home. Vittoria had a lovely and infectious laugh. As she described the bullies and primadonnas that were the stuff of her business, and the extraordinary parties they all went too, hoping to resurrect the ghosts of ‘La Dolce Vita’, I began to laugh alongside. What a strange sight we must have been to the inscrutable waiters in that place; a couple that had never met before, talking each other’s languages quite appallingly and be-having like long separated friends with years of adventures to catch up on. Towards the end of that meal, Vittoria asked me if I – yes, me – if I had ever modelled. If I met her the next day (she passed me an address) she would introduce me to a col-league and I could give it a go. ‘Some men are really sought after and earn enough to buy a Maserati’, she told me, implausibly. They say there is no fool like an old fool, but then they’ve never tried a young one. I knew, not suspected, but knew as a matter of fact that I had the posture of a sack of Irish potatoes and the elegance of a taproom drunk trying to explain the ballet. Still, I thought I might have a go. As I slept in Il Sole that night a tumble of images and scenes played themselves out for me; yachts, white-jacketed crew and a bevy of scantily clad models on the sun deck with signs beside them saying ‘baste every two hours’. Below decks, drinking whisky and playing cards were Federico Fellini, Marcello Mastroianni, Anita Ekberg, Anouk Aimée, Yvonne Furneaux, Magali Noël, and of course Valentino with his gorgeous Vittoria. It was a jet-set peopled dreamscape of sails and little seaplanes just off the Costa Smeralda. Heady stuff. I persuaded the maid to lend me an iron and I attempted to make my suit look as though it had never served as pyjamas. My goodness, modelling was boring. Vittoria had been right all along. I sat for hours while the girls strutted their stuff, while shouted at, with dreadful music turned up full volume. The Great Designer looked as if he would explode from apoplexy at any minute. A host of seamstresses descended like a swarm of bees onto the leggy models every few seconds with pins and pegs, adjusting the creations to the girls’ reed-like figures – so totally unlike their potential market that the whole thing was close to fraud. There were no men there at all, other than the Great Designer and me. And with that he turned away, in such a manner that he could not possibly watch me. Oh well, I didn’t really want to be a model anyway. Well, I walked up and down the stage. Actually that’s not quite true. Half way along my return journey, the Great Designer shouted ‘basta!’. I got down, and he clapped. The single clap was not for me. It was a signal for the girls to return to their labours. As I re-turned the umbrella to its stand I wondered if could get a job as an extra. Perhaps in a documentary about the Irish Famine. I could play the sack of potatoes. 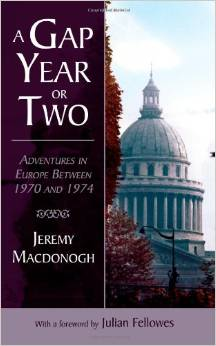 A Gap Year or Two by Jeremy Macdonogh is available now through Amazon and all good bookstores.